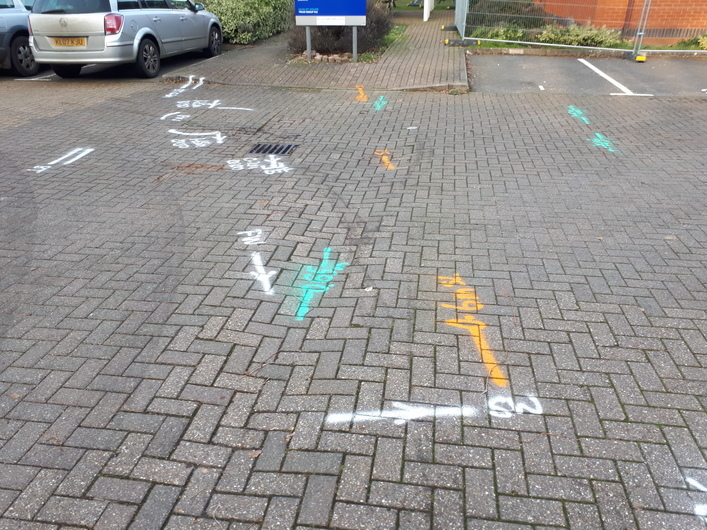 As well as carrying out a full survey, we do provide CAT scans whereby the position, type and depth of buried services & utilities are sprayed onto the ground surface. We can either survey a whole area or provide service clearance for a number of invasive Ground Investigation (GI) locations or positions. This includes borehole, window sample, trial pit or core sample locations. Although a drawing is not provided and GPR data is not post-processed, the methodology used is the same (use of EML, cover lifting and GPR) as for any other utility mapping survey. This provides a cost effective alternative when smaller excavations are planned, such as the installation of bollards, signs and flag poles, or to mark up services prior to cable route installations.